The press pack includes a lovely interview (begins page 7) with Daniel Mays who portrays Reg Evans Corporal 1st Hertfordshire Regiment. ITV begins their extraordinary World War One centenary coverage with World War One: The People’s Story beginning Sunday 10 August at 9:00PM. These moving accounts, revealing their intimate thoughts and feelings, offer a raw insight into the profound impact of being caught up in a conflict that would change their lives – and Britain – forever. Sourced from archives and libraries across the country, selected in partnership with Imperial War Museums, which provided much of the material, and brought to life by actors – each story conveys the hopes, fears, heroism and tragedies of countless ordinary British people… made all the more powerful by the fact that every word is real. Daniel Mays stars in episodes 1 & 2 (to air Sunday 17 August). Posted in 2014, Daniel Mays, ITV, World War One: The People's Story and tagged 2014: television, Daniel Mays, ITV, World War One: The People's Story on July 31, 2014 by Team Daniel Mays. 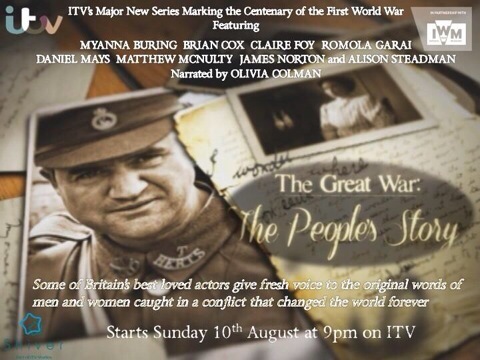 Preview of ITV’s extraordinary World War One: The People’s Story. Coming to ITV in August.